The aphorism ‘a rising tide lifts all boats’ is associated with the idea that improvements in the general economy will benefit all participants in that economy. It is especially relevant in terms of Renewable Energy (RE) and the youth it empowers through socio-economic upliftment intiatives. Take 21-year-old Chardin Booysen, for example. Born and raised in the northern Karoo town of De Aar, Chardin experienced what many matriculants are subject to: Little prospect of further education, and no jobs to secure their economic livelihood. Where many young people would flounder – substance abuse, child neglect, crime and a host of other social ills plaguing previously disadvantaged communities throughout the country – Chardin was fortuitously drawn into the Community Development Workers (CDW) Programme funded by Solar Capital. Having been a CDW since the start of 2015 – “it feels wonderful to be able to serve my community in this manner” – Chardin’s own growth in confidence and progress serve as a shining example. 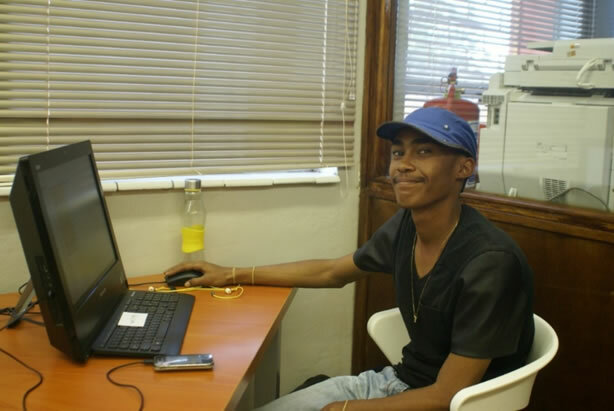 Him and Janet, 23, originally chosen to become facilitators because of their leadership skills, were offered a month-long online computer and IT literacy training course through Vaal University of Technology. “We completed this course and are now assisting anyone who comes to the Community Centre with any challenges they may have with using the computers or free Wifi at the centre.I can help people learn, improve their grades at school, and use the Internet to be creative, start their own initiatives or find jobs for themselves. It’s very satisfying. “Doing the CDW training as well as the course made me look at the world differently. It taught me that you can’t just wait for your circumstances to change, you have to get out there and make opportunities work for you. How does he view the future of South African youth?